Shooting in Venice Beach: Beethoven and Venice Blvd. - Yo! Venice! Home Venice Beach News Shooting in Venice Beach: Beethoven and Venice Blvd. Shooting in Venice Beach: Beethoven and Venice Blvd. 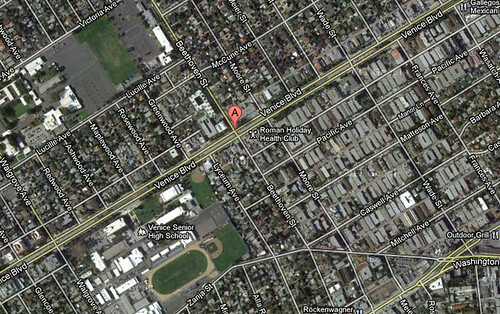 There was a “walk-by” shooting near Beethoven and Venice Blvd. earlier this evening at around 6pm. The shooter (and friends) approached a male and his friend(s). Words were exchanged and the victim was shot in the leg. A Sergeant at the LAPD said the victim was in his late 20’s and his wounds were believed to be superficial. The shooting appeared to be random and as of 10 pm the suspect was not in custody but they have firm leads. The LAPD thinks this is an isolated incident but do advise residents to always lock their doors even when home. More information when the LAPD releases it. It is always advisable to not get into fights, as you never know what the other guy will “bring” to that fight.